When injected intravenously, Technetium Tc 99m Pyrophosphate Injection has a specific affinity for areas of osteogenesis. It is also concentrated in the injured myocardium, primarily in areas of irreversibly damaged myocardial cells. One to two hours after intravenous injection of Technetium Tc 99m Pyrophosphate Injection, an estimated 40 to 50 percent of the injected dose has been taken up by the skeleton, and approximately 0.01 to 0.02 percent per gram of acutely infarcted myocardium. Within a period of one hour, 10 to 11 percent remains in the vascular system, declining to approximately 2 to 3 percent twenty-four hours post injection. The average urinary excretion was observed to be about 40 percent of the administered dose after 24 hours. The non-radioactive reconstituted Kit for the Preparation of Technetium Tc 99m Pyrophosphate Injection also has an affinity for red blood cells. When administered 30 minutes prior to the intravenous administration of Sodium Pertechnetate Tc 99m Injection, approximately 76 percent of the injected activity remains in the blood pool providing excellent images of the cardiac chambers. 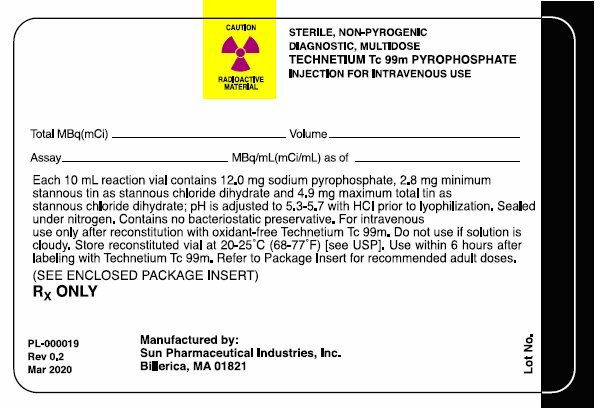 The lyophilized contents of the Kit for the Preparation of Technetium Tc 99m Pyrophosphate Injection reaction vial are to be administered to the patient only as an intravenous solution (see Procedures for Reconstitution). Any Sodium Pertechnetate Tc 99m solution which contains an oxidizing agent is not suitable for use with Kit for the Preparation of Technetium Tc 99m Pyrophosphate Injection. When reconstituted with Sodium Pertechnetate Tc 99m, Technetium Tc 99m Pyrophosphate Injection must be used within 6 hours. Kit for the Preparation of Technetium Tc 99m Pyrophosphate Injection may also be reconstituted with sterile, non-pyrogenic isotonic saline containing no preservatives and injected intravenously prior to the administration of Sodium Pertechnetate Tc 99m Injection. Kit for the Preparation of Technetium Tc 99m Pyrophosphate Injection contains no preservatives. Vials are sealed under nitrogen: air or oxygen is harmful to the contents of the vials and the vials should not be vented. The components of the Kit for the Preparation of Technetium Tc 99m Pyrophosphate Injection are supplied sterile and non-pyrogenic. Aseptic procedures normally employed in making additions and withdrawals for sterile, non-pyrogenic containers should be used during addition of the Sodium Pertechnetate Tc 99m Injection and the withdrawal of doses for patient administration. Shielding should be utilized when preparing Technetium Tc 99m Pyrophosphate Injection. Technetium Tc 99m Pyrophosphate Injection as well as other radioactive drugs must be handled with care, and appropriate safety measures should be used to minimize radiation exposure to the patients and clinical personnel consistent with proper patient management. The solution should not be used if cloudy, discolored, or found to contain particulate matter. Radiopharmaceuticals should be used only by physicians who are qualified by training and experience in the safe use and handling of radionuclides, and whose experience and training have been approved by the appropriate government agency authorized to license the use of radionuclides. No special handling is required for the non-radioactive drug product. Both prior to and following Technetium Tc 99m Pyrophosphate Injection administration, if not contraindicated for the patientâ€™s cardiac condition, patients should be encouraged to drink fluids. Patients should void as often as possible after the Technetium Tc 99m Pyrophosphate Injection to minimize background interference and unnecessary radiation exposure from accumulation in the bladder. Patientâ€™s cardiac condition should be stable before beginning the cardiac imaging procedure. Interference from chest wall lesions such as breast tumors and healing rib fractures can be minimized by employing the three recommended projections. (See DOSAGE AND ADMINISTRATION). False-positive and false-negative myocardial scans may occur; therefore, the diagnosis of acute myocardial infarction depends on the overall assessment of laboratory and clinical findings. The non-radioactive reconstituted agent should be injected by direct venipuncture. Heparinized catheter systems should be avoided, as interference with red blood cell tagging will result. Cardiac pool imaging should be initiated 15 to 30 minutes after the administration of Sodium Pertechnetate Tc 99m Injection. The imaging of gastrointestinal bleeding is dependent on such factors as the region of imaging, rate and volume of the bleed, efficacy of the labeling of the red blood cells and timeliness of imaging. Due to these factors, images should be taken sequentially over a period of time until a positive image is obtained or clinical conditions warrant the discontinuance of the procedure. The period of time for collecting the images may range up to 36 hours. Technetium Tc 99m Pyrophosphate Injection and the non-radioactive reconstituted Kit for the Preparation of Technetium Tc 99m Pyrophosphate Injection should be formulated within six (6) hours prior to clinical use. No long-term animal studies have been performed to evaluate carcinogenic potential or whether Technetium Tc 99m Pyrophosphate Injection affects fertility in males or females. Mutagenesis studies have not been conducted. Animal reproduction and teratogenicity studies have not been conducted with Technetium Tc 99m Pyrophosphate Injection. It is also not known whether Technetium Tc 99 Pyrophosphate Injection can cause fetal harm when administered to a pregnant woman or can affect reproductive capacity. Technetium Tc 99m Pyrophosphate Injection should be given to a pregnant woman only if clearly needed. Ideally, examinations using radiopharmaceuticals, especially those elective in nature, to a woman of childbearing capability should be performed during the first few (approximately 10) days following the onset of menses. Technetium Tc 99m Pyrophosphate Injection is excreted in human milk during lactation, therefore, formula feeding should be substituted for breast feeding. Clinical studies of the Kit for the Preparation of Technetium Tc 99m Pyrophosphate Injection did not include sufficient numbers of subjects aged 65 and over to determine whether they respond differently from younger subjects. Other reported clinical experience has not identified differences in responses between the elderly and younger patients. In general, dose selection for an elderly patient should be cautious, usually starting at the low end of the dosing range, reflecting the greater frequency of decreased hepatic, renal, or cardiac function, and of concomitant disease or other drug therapy. The Kit for the Preparation of Technetium Tc 99m Pyrophosphate Injection is supplied in packages of 5 or 30 sterile, non-pyrogenic, white capped 10mL vials. Each multidose vial contains 12.0 mg sodium pyrophosphate, 2.8 mg minimum stannous tin as stannous chloride dihydrate and 4.9 mg maximum total tin as stannous chloride dihydrate; pH is adjusted with hydrochloric acid to 5.3-5.7 prior to lyophilization. No bacteriostatic preservative is present. Sealed under nitrogen. 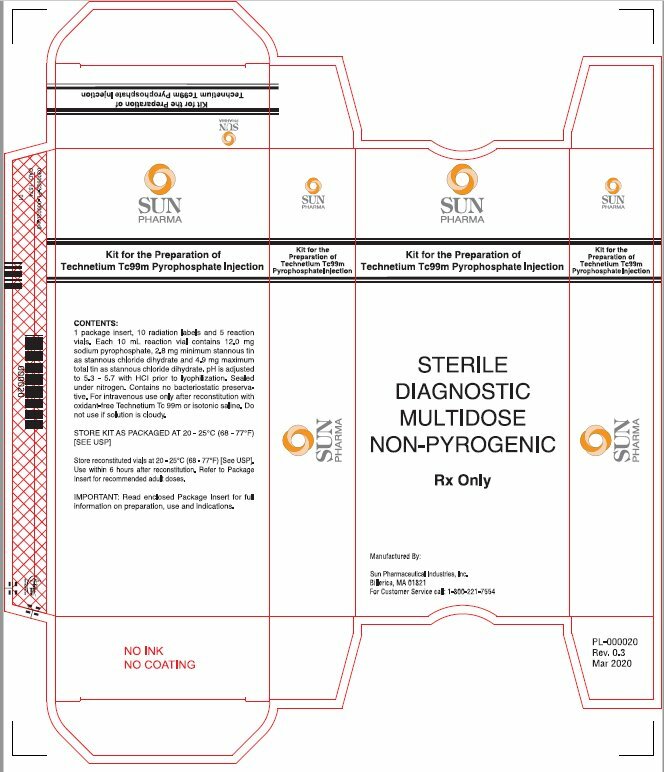 Included in each 5-vial package are one package insert and 10 radiation labels. 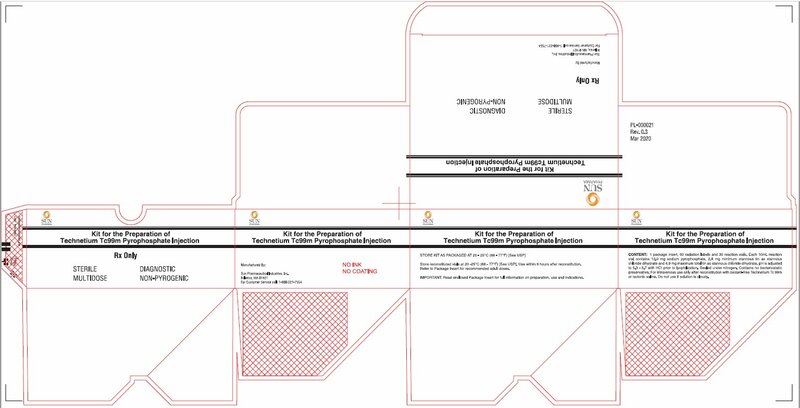 Included in each 30-vial package are one package insert and 60 radiation labels. vials at 20-25°C (68-77°) [See USP]. • Waterproof gloves should be worn during the preparation procedure. Remove the white flip-off cap from the vial and swab the top of the vial closure with alcohol to sterilize the surface. • Complete the radiation label and affix to the vial. Place the vial in an appropriate radiation shield suitably labeled and identified. • With a sterile shielded syringe, aseptically obtain 1-10 milliliters of a suitable, oxidant free, sterile and non-pyrogenic Sodium Pertechnetate Tc 99m Injection containing no more than 3.7 gigabecquerels (100 mCi). Aseptically add the Sodium Pertechnetate Tc 99m Injection to the vial. • Swirl the contents of the vial for one minute and let stand for at least 10 minutes. • Record date and time of preparation. • It is recommended that the radiochemical purity of the prepared radiopharmaceutical be checked prior to patient administration. • Examine vial contents for particulates and discoloration prior to injection. • Withdrawals for administration must be made aseptically using a sterile shielded syringe and needle. Since the vials contain nitrogen to prevent oxidation of the complex, the vials should not be vented. If repeated withdrawals are made from a vial, the replacement of contents with air should be minimized. • Aseptically withdraw material with a sterile lead shielded syringe for use within six (6) hours of preparation. For optimal results, this time should be minimized. The vial contains no bacteriostatic preservative. Store the reconstituted vial at 20-25°C (68-77°F) [See USP]. Discard the vial six (6) hours after reconstitution. • The patient dose should be measured by suitable radioactivity calibration system immediately prior to administration. • Remove the white flip-off cap from the vial and swab the top of the vial closure with alcohol to sterilize the surface. • Reconstitute the reaction vial with 3 milliliters of sterile, non-pyrogenic, isotonic saline containing no preservatives. • Withdrawals for administration must be made aseptically using a sterile syringe and needle. Since the vials contain nitrogen to prevent oxidation of the complex, the vials should not be vented. If repeated withdrawals are made from a vial, the replacement of contents with air should be minimized. • Aseptically withdraw the reconstituted non-radioactive Kit for the Preparation of Technetium Tc 99m Pyrophosphate Injection with a sterile syringe for use within six (6) hours of preparation. For optimal results, this time should be minimized. The vial contains no bacteriostatic preservative. Store the reconstituted vial at 20-25°C (68-77°F) [See USP]. Discard the vial six (6) hours after reconstitution. • Between one-third and a total vial of stannous pyrophosphate may be administered by direct venipuncture 30 minutes prior to intravenous administration of 555 to 740 megabecquerels (15-20 mCi) of Sodium Pertechnetate Tc 99m Injection. Heparinized catheter systems should not be used. • The patient dose of Sodium Pertechnetate Tc 99m Injection should be measured by a suitable radioactivity calibration system immediately prior to administration. This reagent kit for preparation of a radiopharmaceutical is approved for use by persons licensed pursuant to Section 120.547, Code of Massachusetts Regulation 105, or under equivalent license of the U.S. Nuclear Regulatory Commission or an Agreement State. Each 10mL reaction vial contains in 12.0 mg sodium pyrophosphate, 2.8 mg minimum stannous tin as stannous chloride dihydrate and 4.9 mg maximum total tin as stannous chloride dehydrate; pH is adjusted to 5.3-5.7 with HCI prior to lyophilization. Sealed under nitrogen. Refer to Package Insert for directions for use and the recommended adult doses. [See USP] after reconstitution and use within 6 hours. 1 package insert, 10 radiation labels and 5 reaction vials. Each 10 mL reaction vial contains 12.0 mg sodium pyrophosphate, 2.8 mg minimum stannous tin as stannous chloride dehydrate and 4.9 mg maximum total tin as stannous chloride deihydrate. pH is adjusted to 5.3 â€“ 5.7 with HCI prior to lyophilization. Sealed under nitrogen. Contains no bacteriostatic preservative. For intravenous use only after reconstitution with oxidant-free Technetium Tc 99m or isotonic saline. Do not use if solution is cloudy. Store reconstituted vials at 20-25°C (68-77°F) [See USP]. Use within 6 hours after reconstitution. Refer to Package Insert for recommended adult doses. Each 10mL reaction vial contains 12.0 mg sodium pyrophosphate, 2.8 mg minimum stannous tin as stannous chloride dihydrate and 4.9 mg maximum total tin as stannous chloride dihydrate; pH is adjusted to 5.3-5.7 with HCI prior to lyophilization. Sealed under nitrogen. Contains no bacteriostatic preservative. For intravenous use only after reconstitution with oxidant-free Technetium Tc 99m. Do not use if solution is cloudy. Store reconstituted vial at 20-25°C (68-77°F) [see USP]. Use within 6 hours after labeling with Technetium Tc 99m. Refer to Package Insert for recommended adult doses. CONTENTS: 1 Package insert, 60 radiation labels and 30 reaction vials. Each 10 mL vial contains 12.0 mg sodium pyrophosphate, 2.8 mg minimum stannous tin as stannous chloride dihydrate and 4.9 mg maximum total tin as stannous chloride dihydrate. pH is adjusted to 5.3 â€“ 5.7 with HCI prior to lyophilization. Sealed under nitrogen. Contains no bacteriostatic preservative. For intravenous use only after reconstitution with oxidant-free Technetium Tc 99m or isotonic saline. Do not use if solution is cloudy. Store reconstituted vials at 20-25°C (68-77°F) [See USP]. Use within 6 hours after reconstitution. Refer to Package Insert for recommended adult doses.